A fine song that isn't actually about drugs. Those who are consistently in the know about the European dance music scene should easily recognize the name "ATB". ATB, the most popular pseudonym of German producer and composer André Tanneberger, has been (and still is) heavily beloved all over the world ever since he released two of his staple dance tracks, "9PM (Till I Come)" and "Don't Stop", in 1999. And of course, we cannot ignore his days prior, as a member of the dance group, Sequential One (sometimes scribed as SQ-1). Since 1999, he has released (as of this review's writing) six albums, one compilation album, and twenty singles, many of which have achieved significant chart success. Over the course of his history as an independent artist, his focus has been the subject of a constant metamorphosis; he has transformed himself from a solely dance producer to a full-on trance and pop craftsman. While this has never been more apparent in his most recent album, "Trilogy", elements of this transition first became apparent on the 2004 album, "No Silence", from which the single, "Ecstasy", arises -- and that's the single being reviewed here. "Ecstasy" invites the popular singing talents of British songstress Tiff Lacey who delivers an incandescent performance on this and several other tracks on "No Silence" (although she does not appear in the music video of "Ecstasy"). Her vocals are then perfectly complemented by ATB's more acoustic style of production here, as opposed to his typically synthetic style from previous albums. The AT&B Airplay Mix makes effective use of a synth pluck, acoustic guitar, piano, and a more realistic sounding drum set than he has used in the past. 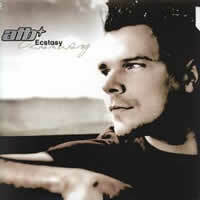 Indeed, this is the evolution of ATB, and ever since I heard this version, I fell in love with his new style. The Original Airplay Mix is slightly different in that the focus is indeed more on the dance element, foregoing the real instrumentation in favour of traditional beats and synths. Both versions are superb, but the AT&B Airplay Mix will appeal to a broader audience. The Clubb Mix (which is spelled with two Bs for reasons unknown) is definitely designed for club play instead of home listening, but it is nevertheless present on this CD single. It follows a trancier pattern with pads not unlike other German trance artists, as well as a deep bassline that, when played in a dance club, could move the floor a bit with its subtle vibrations. Interestingly enough, however, is the fact that the Clubb Mix is actually LESS busy than the two radio edits; ultimately, there isn't enough excitement, aside from Tiff Lacey's voice, to keep clubbers truly amused for the full duration of the track. Perhaps the slightly techier A&T Remix can solve this problem. Bearing a fairly close resemblance to the original but sporting a punchier kick, a more unusual bass instrument, and the return of the piano, this one plays out overall as an extended mix. It's good if you want a longer version of the Original Airplay Mix. I am happy to report that this track is one of ATB's classiest moments, one that he appears to try and top with subsequent releases but never quite reaches that peak of... well, ecstasy, to be honest. That being said, I can easily recommend this single to dance and pop enthusiasts alike. Although the Clubb Mix isn't quite up to ATB's usual standards, the rest of the material is a testament to the effective compositional quality and emotional accessibility that André Tanneberger can tap into when he puts his mind to it. Hopefully more singles like this one will come in the future, if he ever gets off his excessively pop-oriented pedestal. Excellent work!